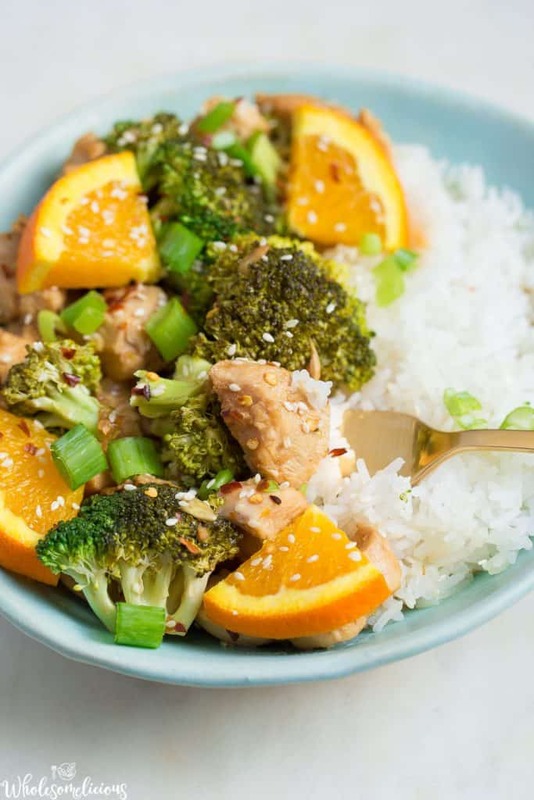 This simple Asian dish is reminiscent of your favorite take-out meal, without the junk ingredients! Orange juice and ginger provide the right amount of sweetness in an all-natural way. This easy peasy Instant Pot dinner can also be made in the Slow Cooker for ultimate ease! Let’s talk busy weeknights shall we? What is your go-to dish? 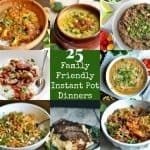 I can go for a variety of options, but my favorites include anything with chicken, veggies, and my Instant Pot. I am pretty simple, and just want easy, tasty, and healthy. And to keep my people happy, I lean toward anything Mexican or Asian. 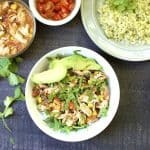 So with just a few weeks before school starts, and when we get back to “the grind”, I have been working on some more Instant Pot recipes to add to our regular rotation. You guys asked for more Instant Pot, and here I am delivering you another gem! 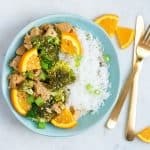 This flavorful dish is everything you want for feeding your family: super easy, nutrient dense, and one that my kids and husband LOVED. Did I mention Whole30 approved? Husband and I will be working on another round starting in September. It’s been one of those summers……The kind where we know a reset is in order! 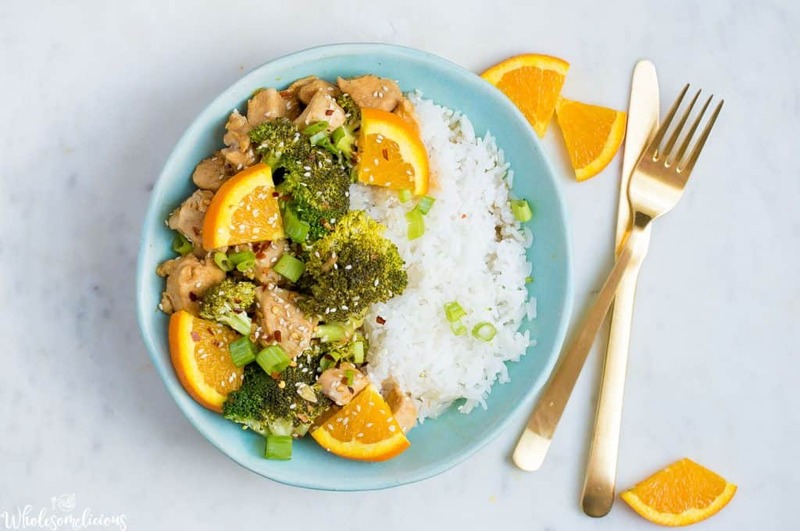 I am loving that oranges provide the natural sweetness with a little tang, some fresh ginger for that Asian flavor we all love, broccoli that is perfectly steamed in the Instant Pot, and then topped with some more goodies! This delicious dinner also has a crispy coated chicken, and a deliciously flavorful sauce. 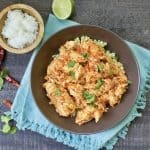 Serve over rice or cauliflower rice! 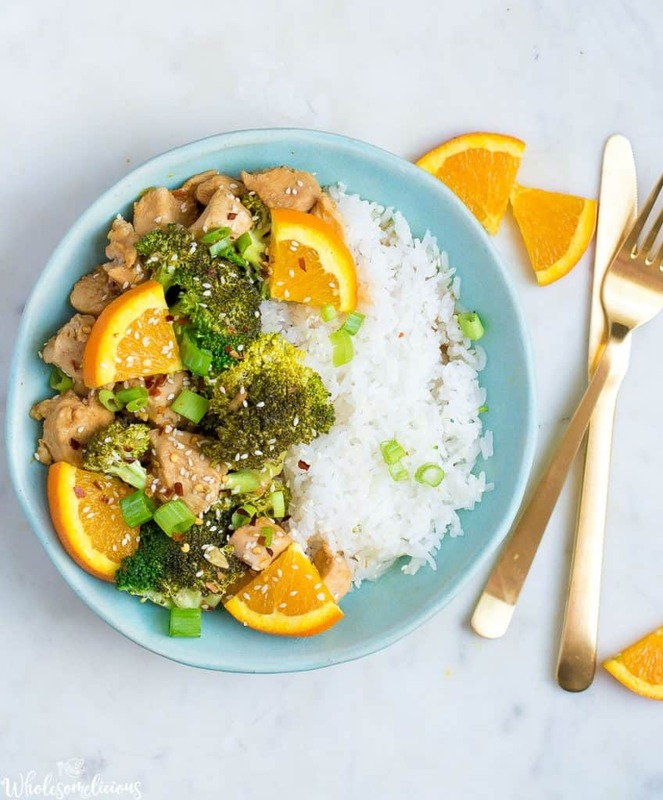 In a small bowl, whisk together the sauce ingredients: coconut aminos, orange juice, vinegar, sesame oil, orange zest, 2 cloves crushed garlic, 2 tsp fresh ginger, and crushed red pepper (if using). Place chicken and arrowroot starch inside a resalable bag or container. Shake around until chicken is well coated. Select the saute function on your Instant Pot. Once hot, add the avocado oil, 1 tsp garlic, and 1 tsp chopped ginger. Stir, then add chicken. Cook for 1-2 minutes until the chicken is slightly browned. Select the cancel function. Now pour the sauce on top of the chicken. Secure the lid, ensuring the valve is in the sealed position. Select "manual" or "pressure" function and cook on high pressure for 7 minutes. Once cooking is complete, use a quick release. Remove the lid once the steam has been released, and toss in chopped broccoli. Stir, and place the lid back on the IP to let the broccoli steam and cook for another 3 to 4 minutes. Serve over rice or cauliflower rice with sesame seeds and green onion (if using). For slow cooker, follow the same instructions with the whisking of the sauce. Coat the chicken with arrowroot starch like above and place chicken inside your slow cooker. Pour sauce over the top. Cook on low for 4-5 hours. *The orange juice in this recipe is fresh squeezed from an orange. It took about 1 1/2 oranges to get 1/2 cup. If not following a strict Paleo or Whole30 diet, you can use store bought orange juice. 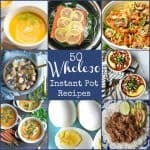 50+ Whole30 Instant Pot Recipes!! OJ is not Whole30 approved, is it? The book says it is not. Nope, it’s not. Fresh squeezed means to juice an orange, that is what the asterisk is there for, but I forgot to include in the note section of the recipe. I’ll change that now! It takes right around 2 oranges. Can you clarify “steam the broccoli” at the end of the recipe? Is this using the IP Steam function (so the total time will be more than 3-4 min) or is it steaming in the steam left over from cooking? Thanks! I can’t wait to try it )as soon as it finishes steaming!). Just put the lid on and let natural steam cook the broccoli. Enjoy it!! really good flavor. few issues I ran into, due to the thick nature of the sauce and not a lot of liquid content when pressure cooking, I got the “burn” error. had to de-pressurize and then add a cup of water. Also the “steaming” the broccoli after pressure cooking didn’t work. So then I had to add more arrowroot and saute the mixture after cooking in order to thicken the sauce and tenderize the broccoli. Final product very good though! Thanks for the feedback, Lee! I do like my broccoli more crunchy, and al dente. So, I can add a step that you could steam the broccoli in the microwave if you want it cooked more. Also, haven’t had a problem with burn, BUT, sometimes I get the burn notice on recipes I’ve made often that will work and other times they don’t. Who knows with the IP! 1-2 tbsp to coat the pot!